So let me ask you this. 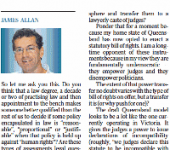 Do you think that a law degree, a decade or two of practising law and then appointment to the bench makes someone better qualified than the rest of us to decide if some policy encapsulated in law is “reasonable”, “proportional” or “justifiable” when that policy is held up against “human rights”? Are these types of assessments legal questions or are they just politics dressed up as law in order to remove them from the political sphere and transfer them to a ­lawyerly caste of judges? Ponder that for a moment because my home state of Queensland has now opted to enact a statutory bill of rights. I am a long-time opponent of these instruments because in my view they are fundamentally undemocratic – they empower judges and they disempower politicians. The extent of that power transfer no doubt varies with the type of bill of rights on offer, but a transfer it is (or why push for one)? The draft Queensland model looks to be a lot like the one currently operating in Victoria. It gives the judges a power to issue declarations of incompatibility (roughly, “we judges declare this statute to be incompatible with human rights” – clause 53). Why you would want judges to pontificate in this way – if we take seriously the assurance that politicians are to have the last word – is hard to fathom. Maybe it’s because looking around the statutory bill of rights world what you see is that overwhelmingly politicians cave in to what the judges “declare”. Then there is one of the above type “reasonable limits” provisions (clause 13) that ask judges to consider if they happen to think some law infringes on rights in a reasonable or unreasonable way. Then there is the usual reading down provision that you see not just in Victoria’s statutory bill of rights but also in the New Zealand and British models. In Queensland this is clause 48 and it basically directs the judges to do all that is “possible” to interpret all other statutes in a rights-respecting way. Now it doesn’t take a genius to see that this is an open-ended ­invitation to judges to rewrite legislation in the name of ­”finding” some “more compatible” interpretation. That though presupposes that there are often multiple meanings of enacted laws and ex-lawyer judges get to pick between them – a sort of new age “reader-response” view of what interpretation is. The worst imaginable example of this came from the UK, where a similar reading down provision (in a case called Ghaidan) was used by the top British judges to say that they could “read words in”, “ignore the clear intention of parliament” and basically give laws just about any “meaning” they wanted short of “judicial vandalism”. And did I mention that clause 48 (3) directs Queensland’s judges to consider overseas case law, cases like Ghaidan? You also have what is called an “override by parliament” clause 43. This says that parliament can declare some Act “has effect despite being incompatible” with a human right. But what’s the point of that? Remember, this is a bill of rights where the judges cannot invalidate other statutes anyway. Hence the only point of clause 43 looks to be to implicitly downgrade regular statutes, a quiet invitation for judicial activism. I could point out that this Queensland Bill goes beyond listing just the usual civil and political rights to include also a couple of economic and social rights. But why bother. This is just more of the same from the pro-bill of rights crowd. These days that crowd comprises the vast preponderance of university law academics and a solid majority of lawyers. Why might that be? My own take is that rights-related disputes involve highly contentious issues over which nice, reasonable people disagree. One way to resolve them is to count us all equally and vote. That’s called democracy. But if your favoured outcomes are not being satisfied frequently enough, and if you think the legal caste tends to agree with you more often than what politics produces, another option is to frame these disputes in terms of timeless human rights, hand them over to a lawyerly caste of judges, and give them a souped-up interpretative power (clause 48) along with a God-like declarations power (clause 53). That is the route Queensland is choosing. An astute observer would note that in all the Anglosphere jurisdictions in which these instruments have been brought in, it is always done by the political left – that’s true of NZ in 1990, the UK in 1998, the state of Victoria in 2006, and now true of Labor in Queensland. You would also note that the right-of-centre parties all opposed the introduction of these instruments but later caved in under pressure from the guild of lawyers and special interest groups (witness Ted Baillieu in Victoria). So it is hard to be optimistic about Queensland’s LNP doing anything about the latest Alice in Wonderland bill of rights.